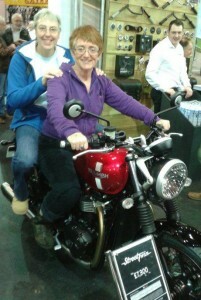 Jessie Normaschild and Sue Barnes, amongst others, went to the MCN Bike Show at ExCel recently and sat on a lot of bikes. 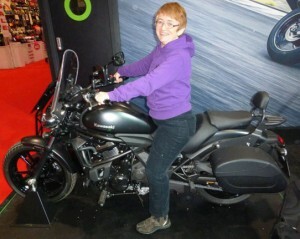 Jessie says: I currently ride a 2007 Kawasaki ER-6 which is 790 mm. The balls of my feet reach the ground, but now I want something lower. 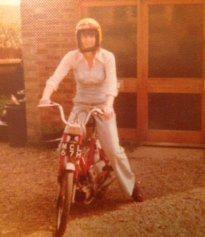 Not fussy about engine size, anything from 250-800cc would be fine. However, engine size is unrelated to frame size, as far as manufacturers are concerned, so smaller doesn’t necessarily mean lower. 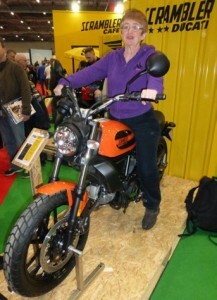 However, this year at the Show, there was actually not just one low bike to look at, but a choice!! 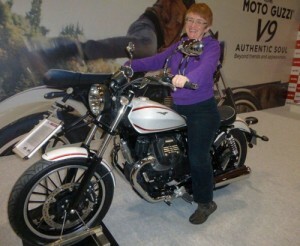 All the bikes are in the £7000+ range. Kawasaki Vulcan Cruiser. 701mm. The delights of being able to get your feet flat on the floor! 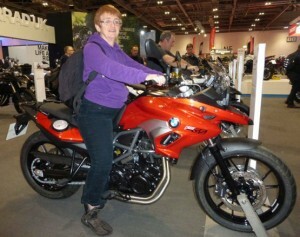 However, it is a cruiser…..
Amazingly this BMW GS700 is low! First time in 35 years of riding I can genuinely consider a BMW! 790 mm but it must be a slim waisted saddle as it felt fine. Liz Robinson added that the GS is definitely a continent crosser, and that I should get the hard luggage thrown in as part of the deal! Might need her for the nose to nose negotiation to get that!! In my quest to help a less long legged lass, (From Sue Barnes) I’ve been carrying out a bit of research at the bike shops. The following are the measured heights of bikes from the floor, up and over the seat and back down to the floor the other side. All 2016 models.